Hello there! 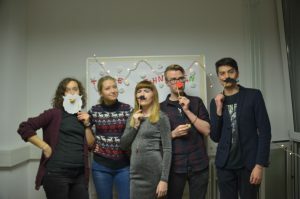 I’m Deniz, a 22 year-old from Turkey, here to experience German culture for 3 months via an internship at Karlshochschule, so I want to share my experiences about the Christmas period during my stay here with you. As someone who is from a country which never celebrates Christmas, one of the things I like about being in Germany in winter the most is to witness the Christmas spirit. I always find its cozy atmosphere so heartwarming, so not surprisingly it makes me want to experience everything that can be done during Christmas time. 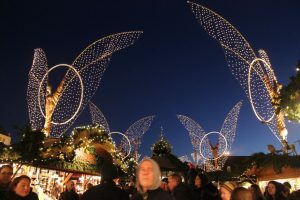 And of course one of the top things on the list of what to do is going to a Christmas market! I already like excursions organized by the university because they help you get together with people, especially with the ones you don’t see very often, if they also come along. 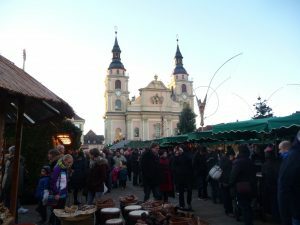 So I was very pleased about hearing that we’d be going to Ludwigsburg’s Baroque Christmas market, which was somewhere I’ve never heard of before hence was curious about. On December 3rd, a group of 9 people gathered at the train station. There were some familiar faces, but also some people that I haven’t met before so it was a great opportunity for me to meet and spend quality time with them. We went there in 2 hours and the weather was cold but thankfully good. As we were approaching the market, I could feel that it was going to be good. It was built next to the big church and even at day time, it looked really nice. As we went there, first thing we looked for was the good food, of course. Some got Bratwurst, some got other nice food that I still couldn’t properly learn the name of and I just got baked potato with yoghurt sauce. Everyone had something different and enjoyed what they had. Some of us had some Waffles after the food which was definitely the cherry on top! And then it was time to drink some Glühwein and enjoy the lovely and crowded view of the Christmas market because as it got darker, it look more and more beautiful with all the decorations and lights and with the wonderful looking church at the background. 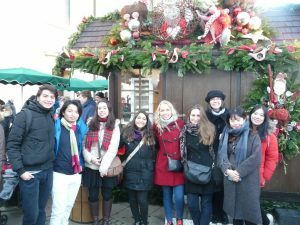 I think every Christmas market has its own different things to see and experience in themselves so getting the chance to see another market in a different city I haven’t heard before was really fun and was better than I expected, especially because everything was organized, well-timed and I was there with nice people. And meanwhile, we didn’t forget to buy some goodies from there as well! I hope I will get the opportunity to do this more often in next few days, let alone the next year! So the Christmas market was fun, even though it wasn’t my first time going to one. But what actually was something I was going to do for the first time: baking Christmas cookies! Scheduled for December 6th, Jutta, our Head of International Office, has kindly invited everyone who is willing to come and bake Christmas cookies together and have fun. Even though I’m not very good with baking or cooking, I was willing to be there even to see what it was like. 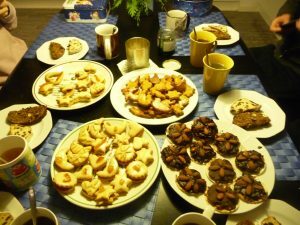 So, me and 5 other International friends went to Jutta’s lovely house and baked 3 types of cookies in 4 hours, which was worth it at the end. I enjoyed doing something like this with people I like a lot and I guess this is the key thing about coming together for Christmas. We baked some orange flavored cookies, also our own Lebkuchen, which was a new thing for me and I liked it. Learning the ingredients in German was quite a challenge for all of us but a fun one. I like how we enjoyed doing the small, strangely time consuming but fun little tasks like, getting the shape for the cookie or putting the icing on top. At the end we had lots of cookies to enjoy and what you see down here is I guess the half of the cookies we baked that evening. And after 4 hours of cooperation and hard work, we finally got the best part: tasting the cookies! We sat around the table all together and tasted what we baked at the end with the addition of Stollen (which has become one of my favourite things) and green tea. We were all proud of what we made at the end they were amazing taste-wise as much as visually! After tasting a few, we stopped ourselves to finish them all so we could take them to the Christmas get together in the next few days for other people to enjoy. And for me, another thing that hasn’t been experienced before: done! 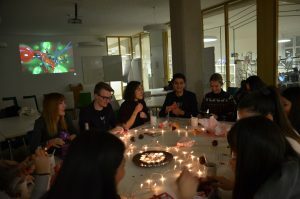 As a follow up for Christmas traditions and celebrations, we thought what would be better than getting together for Christmas at the university to enjoy the cookies we made last week and give each other secret presents? So, we made that happen on December 8th with a few but a lovely bunch of people who showed up for our event! And how can you have an event without taking some photos? So we made a photobooth wall with decorations and props for that and it was our first thing on the list. We had Secret Santa sitting around a table we nicely decorated specifically for this, which is basically receiving presents without knowing who got them by playing a game of dice, and preferably the present is something you don’t use or need and would like to give someone so maybe they will like it. Each time we rolled the dice, we gave the present we hold to our left or right until the round is over, so which present we would receive changed any moment, thus it was so tense! Everyone got different presents from the ones they picked at the first place and I am definitely pleased with the one I received! Then we sang some German and English Christmas carols, English was fine for me but I wasn’t familiar with the German ones so I had to learn them on spot and thankfully everybody sang! Then it was time the enjoy cookies and Glühwein and watch a Christmas movie! The one we picked was Nightmare Before Christmas, which I think is a very nice movie and was a good choice for that night. It was very pleasing for me to watch it with people around me from different countries as well. Being in a country that celebrates Christmas and doing these things with people from many different countries is one of the best experiences I can have and hopefully I will be having more of this in the future.